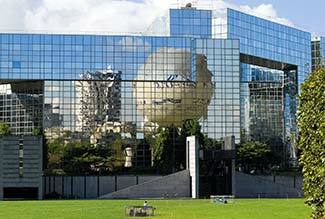 ABOVE: The Ballon de Paris sightseeing balloon is reflected in a glass building next to the Parc André Citroën. INSET BELOW: The tethered helium balloon carries passengers to an altitude of 150 meters or about 500 feet. The balloon is at the Parc André Citroën in the 15th arrondissement, on the left bank of the Seine within leisurely walking distance of the Eiffel Tower. It's a tethered or captive gas balloon, making it a spiritual descendant of "l'Entreprenant" ("The Enterprising"), a hydrogen balloon that the French Army used as the world's first aerial military observation post in 1794. Captive sightseeing balloons have a long and honorable tradition: From 1884 to 1899, the Frenchman Louis Godard operated captive balloons around the world, from Paris to Chicago to Buenos Aires. In Paris alone, one ballon did 1564 ascents over Trocadero and carried 19,194 passengers over a 161-day period; later, in 1895. another of M. Godard's balloons operated for 110 days at the Champ de Mars (near what is now the site of the Eiffel Tower). The present-day tethered Parisian balloon began service in 1999, when an insurance company sponsored the balloon and offered free rides to Parisian children during pre-Millennium celebrations. The balloon then went into storage for several years until it acquired a sponsor. It was relaunched as the Eutelsat Balloon in 2004; more recently, it was renamed "Ballon de Paris" and is currently sponsored by Generali France. The Aerophile balloon used by Ballon de Paris is claimed to be the largest balloon design in the world, measuring 22 meters or 72 feet in diameter. Its fabric envelope is held within a net formed by 9,000 knots, and the balloon is tethered to the ground by a winch-controlled cable. The balloon's spherical shape is preserved by a fan that blows air into a "balloonet" underneath the helium-filled envelope. The round profile minimizes the effects of wind as the helium expands and contracts with changes in atmospheric pressure and temperature. The current balloon, which was introduced in spring of 2008, also serves as an air-quality indicator: Its color changes from green to orange, depending on pollution levels. If electricity fails, the balloon can be reeled in with a backup diesel winch. The Ballon de Paris is in the Parc André Citroën, a few blocks from the Balard station on the Paris Métro. (Take the Métro in the direction of Balard, which is at the end of Line 8.) Signs will direct you to the park. If you're coming from the Eiffel Tower, the Musée d'Orsay, St-Michel, or other neighborhoods on the Seine, take RER Line C along the Left Bank toward Versailles Rive Gauche or St-Quentin-en Yveline and get off at the Boulevard Victor-Pont RER station. The park is hard to miss--just look for the balloon. For up-to-the-minute visitor information, check ballondeparis.com or call 01 44 26 20 00. Also see page 2 of this article for more photos and advice.